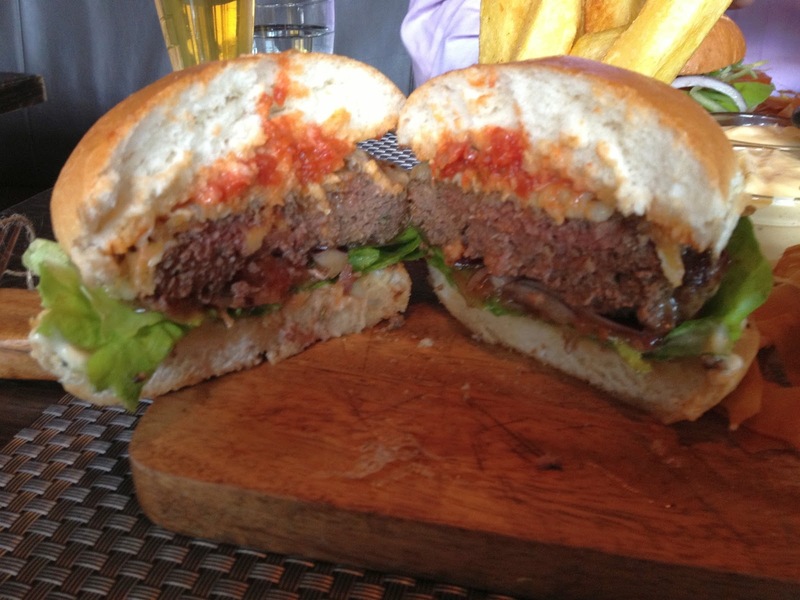 Read a review in the Sunday Star Times, which noted that Portlander had a burger range on their menu. Finding a restaurant that had more than one burger on their menu was rare. It almost made them a bona fide burger joint. We (Brad and I) had to go check it out. Here is what we found!! The Portlander has a really good feel about it. Not too stuffy but still with a bit of class about it. You wouldn't know you were in a hotel restaurant. Which is good if you want to feel comfortable just dropping in (without actually staying there or visiting someone who was staying there). If the food is good, then even the locals will drop by. And I guess that is what they are aiming for. With four $12 burgers ($10 if you order takeout) there is a definite pricing strategy that will appeal to the local lunch crowd. Or that was the idea. The chicken burger is no longer available. The lamb burger is pulled lamb and not a pattie. The third burger is actually vegetarian and served in a lettuce leaf. Which leaves the Bullfighter as the only "real" burger on the menu. The wait staff were very good. Made us want to order more to make it worth their effort. So we added the chunky fries to our order and a Monteith's Single Source lager. The fries were not needed. The burgers were large. And came with a side of kumara crisps. The beer was the perfect match. As you can see from the picture (or from the title of the post) I ordered the Bullfighter. How could I resist. The classic cheeseburger. With caramelised onion and gruyere cheese. Sounded flash. Brad went a bit more exotic with the Lambourghini - pulled lamb shoulder twice cooked with duck fat? but I will leave that for him to review - he sounded like he liked it!! And we weren't disappointed by the nifty presentation. 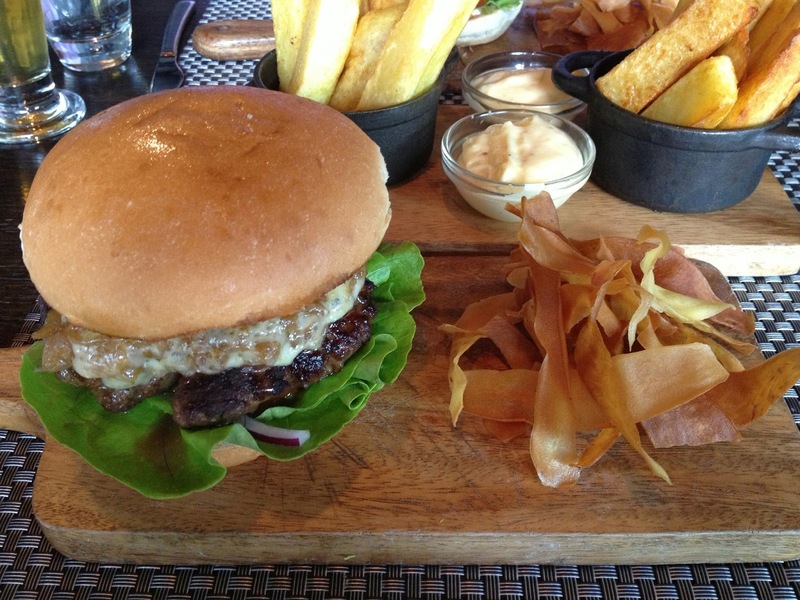 A solid looking burger with height, served on a wooden chopping board. The bun looked tasty and it contained a thick pattie. Upon opening and dissecting, there was a whole lot of moisture added, a tomato relish, the caramelised onion, a gruyere compote/mix (thats the best I can describe it!!) Some buttercup lettuce and onion on the lower bun completed the package. The pattie was well cooked throughout, the bun lightly toasted. 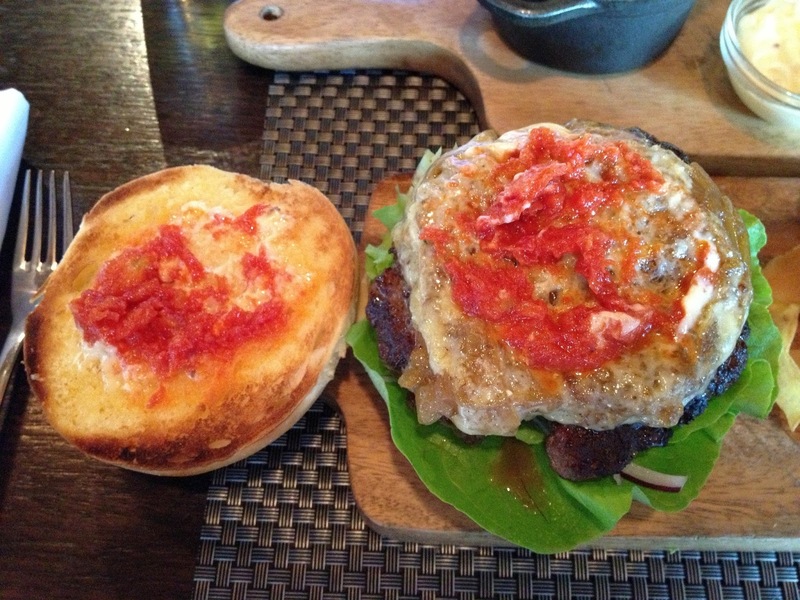 Overall, a well thought out and substantial burger - for $12!! and crisps. Impressive. And even better the burger tasted great. Damn juicy!! I had to ask for a plate to stop the juices from spreading across the table and the fancy thatched placemat. And napkins to keep my suit from the drycleaners. Demolished that burger in short order - Didn't touch the chunky chips. I had no need for them. Ate the Kumara crisps as they were tasty!! Looking across, Brad had obviously encountered a similar level of enjoyment from his burger!! Ultimately we were excited by our discovery. Now if I have to be critical (and you know I will always find fault) the bun was a bit too bready (see cross section), which almost made it taste as it it wasn't toasted. Also, quite finely ground, the pattie could have benefited with slightly less processing and handling (although it was juicy in its own right). Now these are only minor faults and would transform this burger from great to amazing. And you always need to have something more to aspire to. Bravo Portlander. You have made me and Brad happy lads. People, go and have a burger at Portlander. Its worth it...and we will be back!! Regularly.